Update: The Digital TV Converter program ended in July of 2009. The purpose of the program was to make it more affordable for the millions of OTA (over the air) TV users whose old analog sets would stop working when the digital transition occurred on June 12, 2009. Over $990,000 was allocated by the department of commerce from this program. Since the $40 coupons had a 90 day expiration date, they are no longer of value even if found or bought (e.g. on Ebay). At the time, most digital boxes sold for about $60 and were able to be purchased for under $20 using these coupons. Do you need a converter box? Keep in mind, if you own a flatscreen HDTV or recent HDTV, you do not need to purchase a digital converter box. If you still have a ‘regular’ TV and want to watch free over-the-air digital television, you’ll want to pick up a converter box. Since we still get a lot of requests for coupons or inexpensive digital converter boxes, we did a little research and here are the 3 cheapest digital converter boxes we were able to find online…..
We’ve also seen many used and new digital converters listed on ebay, some as low as $15 fixed price and others being sold by auction with selling prices between $15 – $50. eBay Advice: If you are new to eBay make sure you thoroughly read the product description (commonly indicates whether new, used, or partially damaged), factor any shipping costs into the total price and check out the ratings of the seller since you’ll be dealing with an individual as opposed to a store. Previous information about coupon program left for historical purposes. 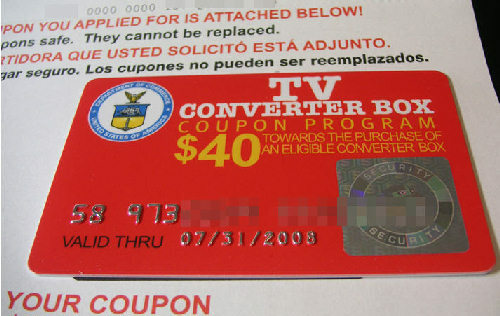 The U.S. Department of Commerce has launched a Digital TV Converter Box coupon program which will provide up to two $40 coupons for the purchase of basic digital tv converter boxes.The coupons actually look like gift cards and are accepted at stores like Best Buy, Circuit City and Radio Shack. This entry was tagged digital converter box coupon. Bookmark the permalink. Thank you for putting the USDC converter box coupon link onto your site. You made it so easy to apply for and now I’m looking forward to saving a further $40 as well as the $95.00 per month I was wasting on cable tv. You’re welcome Priscilla! Glad you found our site useful. How many digital converter box do I need? Do I need 1 for me and 1 for the kid rooms? Can you list of the equipments that I need to have so I don’t have to pay the cable company monthly fees.? I would like to know if i cancell my satelite service can I still get service on my tv or just my computer. I perfer the tv due to size and location. Max: Basically, you’ll need one digital converter box for each TV. Then just plug each converter into antenna. If you already have an external VHF/UHF antenna on your roof you should be able to use it. Otherwise you can purchase a set top antenna like like this one. Hi Keith – You don’t need a computer to receive free digital broadcast TV, just a converter box. Thanks. Wow this is great info. Thank you very much, very helpful and thorough. I will share with all my friends. Thanks again. We got our 2 coupons but when we went to use them they had been expired even though the date on the card was still good. We were told to write our congressman…what a load. Can I even get another coupon? The people on the phone said this was a common complaint they were getting. My advice: Use the cards as soon as possible after you get them. antenna if that is required. We have a lot of trees around us but are well within range of all the local stations. ?